People who make their own granola have a certain reputation for being smug. And, you know what? The smugness is totally earned. In between playing with my new kittens yesterday afternoon (after my trail race and before triathlon swim training!) I managed to make 2 full batches of granola with very little effort at all. Thankfully. – keeps for a month in an air-tight container, so quick, delicious breakfast is always at hand. This heart of this recipe is adapted from Alaska From Scratch. My lovely friend Elaina, who blogs her Danish adventures over at Fint Og Deljig, inspired the addition of olive oil, which adds a lovely earthy tone. I’ve used a blend of olive and coconut oils, but you could use just one or the other. The quinoa adds a lovely crunch, along with some good hits of iron and protein. If you’re training extra hard, add some chopped nuts and soy/greek yogurt for extra protein for your tired muscles. What’s your go-to breakfast? Do you eat the same thing every morning, or mix it up? 2cm piece of ginger, grated finely. 1. Melt your coconut oil and add to a large mixing bowl (or olive oil if you’re using that instead). Add in all of the ‘first ingredients’, starting out with 2 tbsp of olive oil. Mix up with a spoon or your hands, and make sure that all of the oats have a good sheen. If not, add more oil, little by little, until it does. 2. Spread out thinly on baking trays and bake for 15 minutes, watching closely and shaking them every 5 minutes. 3. 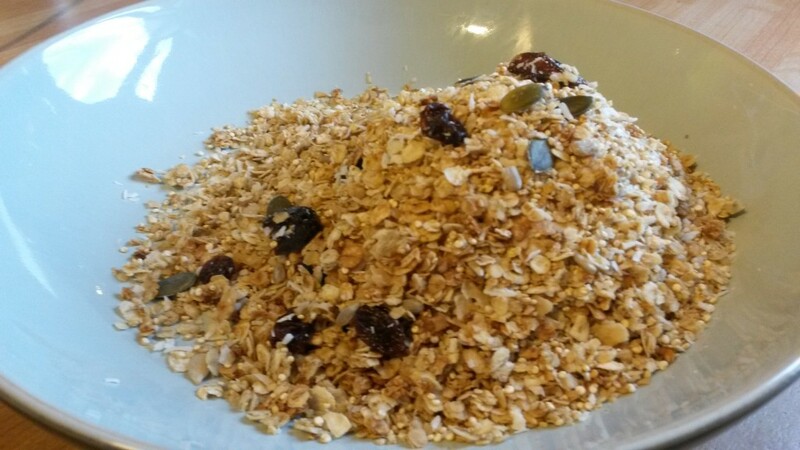 Pour a little of each of the ‘second ingredients’ onto each baking tray with the warm granola and carefully mix in. Bake for another 5 minutes. NOTE: It will still be soft when you take it out of the oven – it gets crunchy as it cools down. Hi, great recipe. Just wondering if we’re alright eating raw quinoa that has just been roasted in the oven? ?